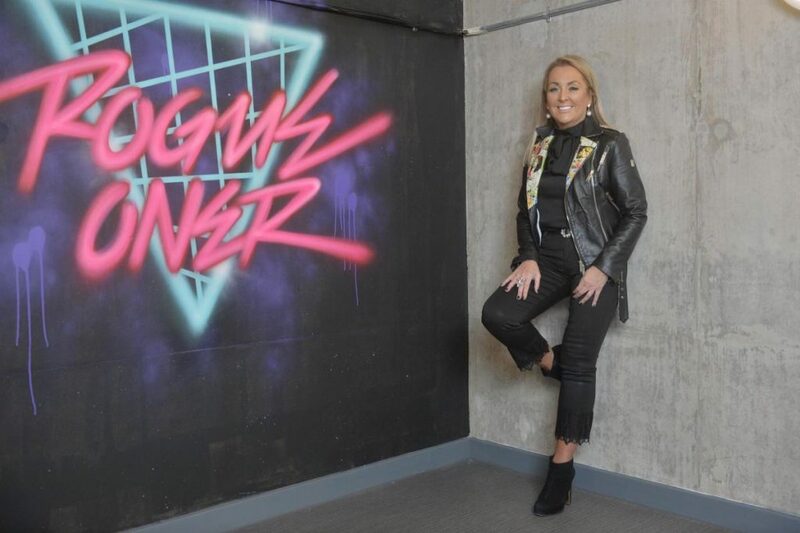 She’s a force to be reckoned with, on a mission to regenerate her childhood home of Kilmarnock and other small towns globally. Marie Macklin tells what made her the determined operator she is today – from growing up in a post-industrial town to her brush with death caused by endometriosis. How areas can be regenerated is of interest to this construction entrepreneur, and at the heart of the urban renewal concept and company, HALO, of which she is director. But she’s more interested in the regeneration of towns, like the Kilmarnock she grew up in, than big city areas like this. For Macklin regeneration is all about “heart and love”. It’s a passion that has its roots in her childhood, growing up in post-industrial Kilmarnock at a time when, all around her, factories were closing. That is where her first HALO project will be built. Macklin, who can boast a whole string of business awards and a CBE, has a bold and brassy personal style. With her blonde hair, bronzed-skin and leather-jacketed bling, she looks as if she could easily occupy one of the edgier seats on Dragon’s Den. But her talk is not of profit or turnover, but of what it takes to regenerate the economy of a community and make it “sing”. It’s not of dragons, but of angels. She believes, she says, in angels, and that’s not an “airy fairy” notion she says, but a grounded one, rooted in her own sense that she got a “second chance” at life when she survived, at 32 years old, a life-changing illness. Collision is a word Marie Macklin uses frequently. It’s how she describes that brush with that illness. It’s also the term she uses for what happened when, in 2009, she was at the head of a community of 20,000 people who marched in Kilmarnock to protest at the closure by international drinks giant Diageo of the Johnnie Walker bottling plant, with a loss of 700 jobs. “A whole community colliding with a PLC,” she recalls, “but then coming together to try to make change”. Nine years on, that 2009 march now looks like it was just the start of the journey towards HALO, a project she hopes will prove itself at Kilmarnock then go on to transform other towns. On the site of the old Johnnie Walker factory, there will, she says, be an enterprise and innovation hub which sounds almost futuristic, providing commercial space and opportunities for cyber and digital-training, an urban park including a wave surf pool, a cafe, a virtual reality arcade and studio housing. One of the project’s key partners is Scottish Power and the plan is for it not only to provide a training centre but to be a zero carbon site, with deep geothermal heating, and its own wind turbine, to power autonomous electric cars. Its ambition is for the site to be at, “the forefront of the fourth industrial revolution”. It is also, says Macklin, one of five projects worldwide that Iberdrola, the parent company of Scottish Power, have picked as test sites for such sustainable technology. That it is has been chosen for this, she observes, is remarkable, because “PLCs aren’t known for coming to small towns”. What happened with Diageo might be one of her more famous “collisions”, but it’s not the one she describes as her biggest. That happened back in 1998, when as a 32-year-old with a promising career in the financial services in London, she was thrown off course by a serious health threat. Back then she was juggling a job at RBS with helping out at her dad’s construction business, KLIN, at the weekends. A hectic weekly routine saw her taking the red-eye down to London on a Monday morning, working to hit targets at RBS all week, then heading back on a Friday to spend the weekend selling houses. What Macklin had, it turned out, was a form of endometriosis called chocolate ovarian cysts. Back then, public awareness of this, as of many so-called women’s problems was scant, though it is now improving. The cysts were bursting inside her, and had been growing there, undiagnosed for years, causing her pain and now internal bleeding. But while she was in the operating theatre she had no idea of this. It’s hard to imagine what the shock of this must have been. For many months following that surgery, Macklin says, she struggled. When she first came to, she was given self-administering morphine to ease her pain, which, she says, she “overdosed on”. “I didn’t go out the house for months. I was in such pain it was horrendous.” She lost all her confidence and thought she would never work again. Her quest following that illness has been to put something into the community. That collision, she believes, changed her. “My turning point was when I took ill in 1997. Would I have come back from the city of London and done what I’ve done here if it hadn’t happened? Working in finance in London was hard. I was a young girl and I wanted to work there and you had to fight your corner and it was ruthless. That makes you hard. I always think what would have happened if that turning point hadn’t happened? But with HALO, she has taken the ethos further. This project was developed with the community, its plans designed through consultation, rather than bringing local views in as an afterthought, and with the chief purpose of generating urban renewal. The story of its creation is rooted in that 2009 protest against Diageo, and Macklin’s desire to turn the closure into something that would help her community. Diageo took that deal and, for that £1, the local community ended up with an eight-acre site, on which Ayrshire College was built with Scottish Government funding. But there was still a 20-acre adjacent site that was unused. Macklin then came up with the HALO proposal, which drew in substantial funding, to the tune of many millions, from many sources, including Diageo. She marvels at the fact that the quiet, bullied kid she describes would become who she is today, a woman who won’t take no for an answer. She doesn’t read books, she says. “Lyrics are my release and music got me through some dark days. Especially after that illness.” She frequently quotes lyrics. When she has a bad day, she puts on a good song to lift her. She’s listening, she says, to Queen at the moment, The Show Must Go On. It’s a breath-taking formula. Heart on her sleeve, and kind, but also a tough as Shellac nails. You can find Marie’s article on The Herald website here.